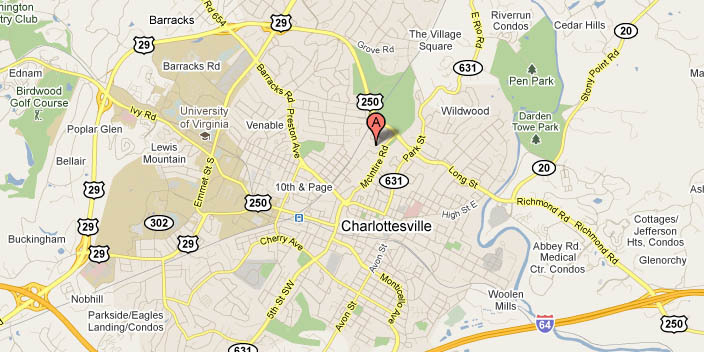 Our club is conveniently located in Charlottesville adjacent to nearby major roads. 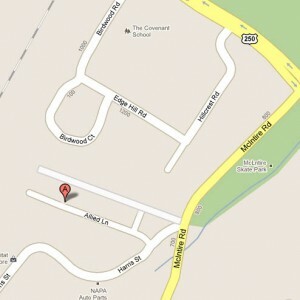 To access our club in Google Maps click below. Google Map Directions for details. From Rt. 250 (heading East), take a right onto McIntire Rd. Bear right at the first light (Harris St.). Take the second right possible onto Allied St (right beside C’ville Coffee). CFA is located on the right near the end of this road. Parking is directly in front of the club with additional parking around back. Handicap access ramp and parking is at the rear of the building. Take I64 West to exit 124. Turn right at the end of the exit ramp, onto Rt. 250 West towards Charlottesville. You’ll go past some shopping centers and car dealerships, across a bridge, up and down some hills. From exit 124 to CFA is about 3.5 miles. After you cross the bridge and come back down a hill, you’ll turn left onto McIntire Rd. There will be an ambulance station on your left as you approach this turn. Then follow local directions above. Take I64 East to exit 124. Turn left at the end of the exit ramp, onto Rt. 250 West towards Charlottesville. You’ll go past some shopping centers and car dealerships, across a bridge, up and down some hills. From exit 124 to CFA is about 3.5 miles. After you cross the bridge and come back down a hill, you’ll turn left onto McIntire Rd. There will be an ambulance station on your left as you approach this turn. Then follow local directions above. Take I95 South to I64 West. Then follow directions from Richmond, above. Take Rt. 29 South to Charlottesville. Once you’re in town you’ll pass lots of shopping centers and such. Before you get to Hydraulic Rd., you’ll want to get into the lane beside the left-most lane. See graphic below for clarification. The farthest right lane will turn into a turn only lane at Hydraulic; the lane next to it will then become an exit only ramp onto Rt. 250 heading West – which is not what you want. Once those two right lanes go away, you’ll now be in the right-most lane and you’ll take the exit for Rt. 250 East. Now follow local directions above.